PEO CS&CSS’s Robot Logistics Support Center uses IDIQs and a unique sustainment approach to keep robot systems up and running. Conventional Army contracting mechanisms can be manpower-intensive, cumbersome and costly. The Robot Logistics Support Center (RLSC) uses indefinite delivery/indefinite quantity (IDIQ) contracts to keep costs down, minimize demands on contracting personnel and quickly return repaired systems to the warfighter. Part of the Project Manager for Force Projection within the Program Executive Office for Combat Support and Combat Service Support, the RLSC is the Army’s only source of repair and maintenance for its fleet of more than 4,000 non-standard robots, consisting of five different models and 28 unique configurations. The RLSC sustainment team conducts repair and return services at 11 locations in the United States and a site in Kuwait; a new site is slated to open soon in Germany. The organization also provides robot sustainment and training support to the U.S. Air Force, the U.S. Coast Guard, the U.S. Marine Corps and the National Guard Bureau, as well as foreign military sales (FMS) partners. RLSC establishes a five-year IDIQ contract with each robotic original equipment manufacturer to supply parts at the wholesale and retail levels for robot repairs as well as for recapitalization and reset activities. It currently has IDIQs with two manufacturers, both in Massachusetts: QinetiQ North America in Waltham and Endeavor Robotics in Chelmsford. The use of IDIQs reduces procurement action lead time and the effort that goes into requirements package preparation. It also yields benefits in the form of shorter staffing, faster execution, more direct lines of communication with manufacturers and no vendor fees. IDIQs also boost small business participation, resulting in a more stabilized and solid robotics industrial base. Late in 2018, the RLSC Contracting and Budget Team received the Secretary of the Army Award for Excellence in Contracting for Outstanding Unit/Team in the category of Systems, R&D, Logistics Support (Sustainment) Contracting as a result of its use of IDIQs and its approach to sustainment. An IDIQ contract provides for an indefinite quantity of a product or service, with stated limits, during a fixed period. This type of contract requires the government to order (and the contractor to furnish) at least a stated minimum quantity of supplies or services. The contracting officer decides a reasonable maximum quantity for the total contract. IDIQs can streamline the contract process and speed delivery times. The main content of the IDIQ contract is the master parts list, which contains each part found at all levels of the bill of materials for all supported robotic platforms—in other words, the smallest replaceable component or smallest part that makes up a larger assembly. The master parts list is especially important to the RLSC to perform immediate field-level repair and return and for depot-level reset and recapitalization sustainment activities. The RLSC holds weekly meetings with each manufacturer to forecast revision of parts, discuss engineering changes and address obsolescence issues. Using IDIQ contracts, RLSC can quickly award delivery orders for any required part or list of parts within one to two weeks. Previously used contracting mechanisms—namely, assisted acquisitions contracts—required a minimum of three months for the preparation of a substantial requirements package, staffing and execution. From a cost perspective, every part on the master parts list is priced for five years, which is extremely beneficial in the areas of budget and planning for projects and programs that span multiple fiscal years. As an example of cost savings, the RLSC transitioned the contracting mechanism on a robot recapitalization program within its portfolio to an IDIQ contract from an assisted acquisitions contract. After contract negotiations, the average cost of a production kit to upgrade a single robotic system was reduced by an estimated $20,000, or 13 percent of the total hardware cost, according to internal estimates. The reduced cost for the recapitalization program provides for acquisition and allows for delivery of additional assets, allowing RLSC to reach full operational capability sooner and for funding to be diverted to other crucial areas such as acquiring spare parts, training and fielding. Additional gains through the use of IDIQs have been made in manpower. Other contracting mechanisms require 1.5 man-years of an RLSC procurement analyst and four man-years of personnel from the U.S. Army Contracting Command (ACC) – Warren, Michigan, to staff an extensive contracting package through to contract award. Under an IDIQ contract, the manpower is reduced to one procurement analyst, one contract specialist and a half of a procurement contracting officer’s time, cutting ACC-Warren contracting manpower figures to 2.5 man-years. Much of that reduction comes because a price analyst is not required to award requirements on an RLSC IDIQ contract, since the master parts list is fully priced from the IDIQ award for five years. While the IDIQ contracting mechanism yields many important benefits, equally beneficial to robot readiness throughout the extensive customer base is the RLSC’s sustainment model. Our maintenance philosophy is to repair robots to the lowest repairable component. 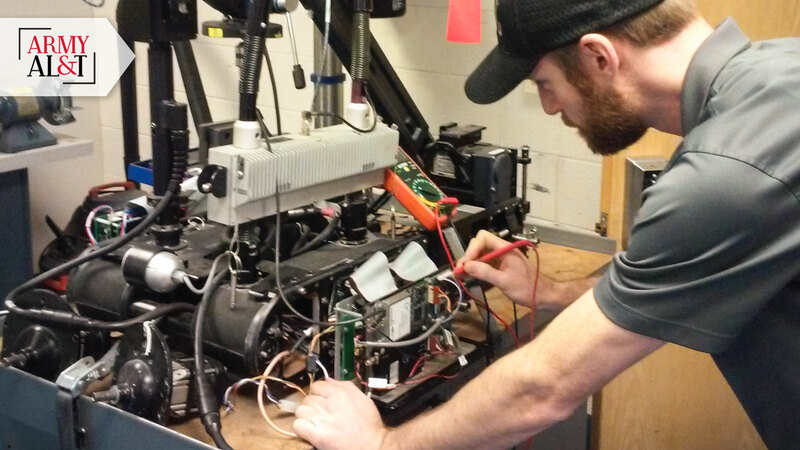 Since we are able to purchase components at the lowest level of the bill of materials for robotics systems, RLSC technicians need not remove a depot-level repair part, or major assembly, from a fully configured robot—essentially removing an entire assembly, shipping it to another facility for repair or refurbishment, and then applying a replacement assembly in its place. Instead, the technician can troubleshoot and then isolate the smallest component causing the failure and complete a work order action to remove and replace it. These lower-level components can include nuts, bolts, screws or other pieces of hardware, wiring harnesses or controller boards. The depot-level repair part replacement process was put in place in 2006 when these robotic systems were first procured for the contingency operations in Iraq and Afghanistan. When the RLSC assumed responsibility for the sustainment of all non-standard equipment robotics systems in 2014, the sustainment strategy shifted to the more agile model that remains in place. For example, a technician might determine that a manipulator arm assembly has a fault: One of the arm’s joints is not moving through its intended range of motion. If the former depot-level repair part model were applied, the technician would have to remove an entire arm assembly and replace it with a costly new or refurbished one. However, under the RLSC’s model, the technician would isolate the fault to the smallest repairable or replaceable component, such as a pinion gear within one of the arm’s motors. There are four major benefits to be realized when applying this model. The first is financial. The cost of a whole arm assembly can exceed $20,000, while the cost of an arm motor pinion is $50. Over a five-year period, we completed approximately 650 work orders to repair robot arms. If every arm was done using the depot-level repair part process, the cost of the arm assemblies would have been roughly $13 million. But filling those work orders using the arm motor pinion gear reduces the cost to approximately $35,000. Even if each work order were isolated to an arm motor, it would only be $3 million versus $13 million, a savings of $10 million over that five-year period. The second benefit is supply availability, impacting the turnaround time for the work order action to be completed. By keeping smaller consumable parts on hand at the retail or shop level, parts can be immediately applied and the work order can be completed within hours instead of days or weeks. The third benefit is the time saved by eliminating the need to change the robot’s configuration. Arm assemblies are high-dollar, serialized components. If the arm assembly is to be removed, additional logistics automation transactions are necessary to adjust the robot’s configuration within the logistics automation database. Finally, the fourth benefit is eliminating the need to send the work to a facility with the capabilities to replace major hardware assemblies on the robotic system. The RLSC has skilled technicians at both the main depot and 13 locations inside and outside of the United States, all of whom are capable of performing field-level and depot-level repairs. The RLSC also recovers legacy systems when new robotic systems are fielded to military units, and these older variants later serve as “seed stock” for future projects. This seed stock method has been applied to two recent recapitalization and modification efforts. The first is a recapitalization of explosive ordnance disposal robots that will serve as a bridging solution until the program of record reaches the materiel release phase and begins fielding the replacement system. The second effort is a modification of an existing platform that detects chemical, biological, radiological, nuclear and high-yield explosives. The modification will provide additional capabilities of area mapping and sensor feedback from the robot to the operator’s position. 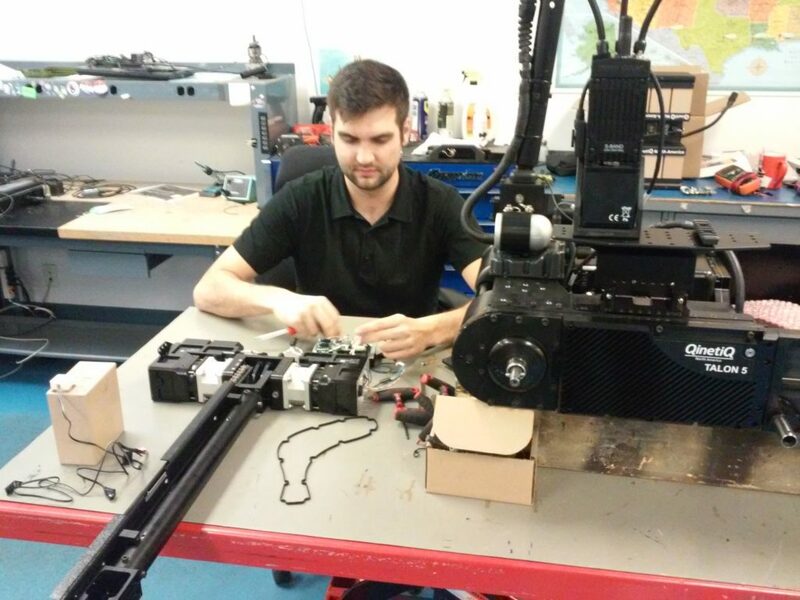 For the second effort, the base chassis of the robot was upgraded to accommodate the installation of additional payloads to provide the increased capability and enhanced performance. A new procurement of this asset would typically cost approximately $315,000 per robot. However, by reusing the base chassis of a seed stock asset, the cost was reduced to $287,000. Key to the RLSC sustainment model is government-led contractor logistics support. 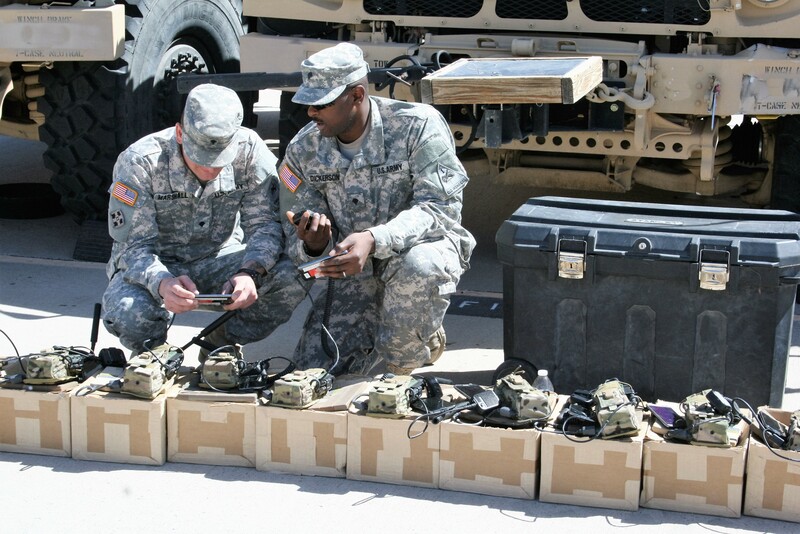 When acquisition professionals think of contractor logistics support, there is a perception that this means program-owned robots or those on military unit property books are evacuated from the program manager shop or from the field to a separate contractor organization for maintenance and sustainment activities. As part of this evacuation process, there is a complicated logistics tail of having to perform multiple government-furnished property transfers to establish a chain of custody as robots are shipped to and received from the contractor. Instead, the RLSC embeds contractors into the government maintenance induction process and employs a logistics automation database that makes additional transfer of government-furnished property unnecessary. RLSC contractors are as organic to the mixed-manpower staff as the government civilian employees, ensuring a cooperative relationship between contractors and government representatives that has lasted more than a decade with an exceptionally high degree of success. An FY19 recapitalization production kit purchase for explosive ordnance disposal robots. Semiannual sustainment parts purchases for several robotic platforms. Numerous foreign military sales cases for robots, parts and training. The flexibility and experience that has grown within the organization, accompanied by the agility and efficiency found in the execution of IDIQ contracts and our maintenance approach, allow the RLSC to provide the highest level of sustainment support for its worldwide customer base and user communities, ensuring the safety and lethality of today’s warfighters. THOMAS A. LETTIS is director of RLSC, a position he has held since October 2016. Lettis entered civil service in 2005 after serving 21 years in the Army and retiring as a command sergeant major. He holds an M.A. in program management and a B.S. in business administration from Excelsior College. He is a member of the Army Acquisition Corps and is Level III certified in program management and life cycle logistics. ADAM BENNETT is a product support integrator in the RLSC. An 11-year Army veteran, he has worked in defense robotics for a decade. He holds a B.S. in criminal justice from Ferris State University.